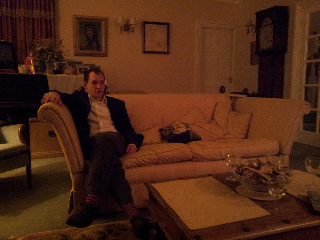 We're at Louisa's for a party tonight. I've bartered sleep in a proper bed for making curry and naan for the party. 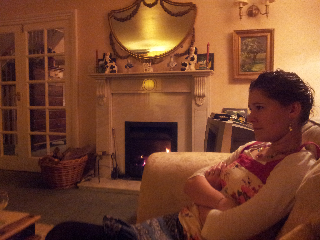 We're sat chilling waiting for the party to start with wine and a roaring fire. Today Tom and I have had a lazy lie in and shopped for party food. Last night we went to eat tasty pork from Oink and had icecream. The highlight of last night was Tom teasing Ben and Laura's hamster. It would run up a cardboard tube, and Tom would spin the tube as Snoopy was running, delivering the hamster back where he started. The hamster looked so confused, then would try again. Then the hamster got bored.